Though the season technically started at the end of September, it’s safe to say that fall has finally, firmly, and officially arrived. There probably won’t be any more unseasonably warm days this year, and—after falling back an hour in last weekend’s daylight saving time change—days are getting shorter. Along with autumn’s arrival comes the desire to warm up with foods that are suited for the season. Along with the soups, casseroles, slow cooker staples, and pies that highlight fall feasting, pho should also be part of your life when the temperatures dip, the daylight hours dwindle, and your spirits diminish. 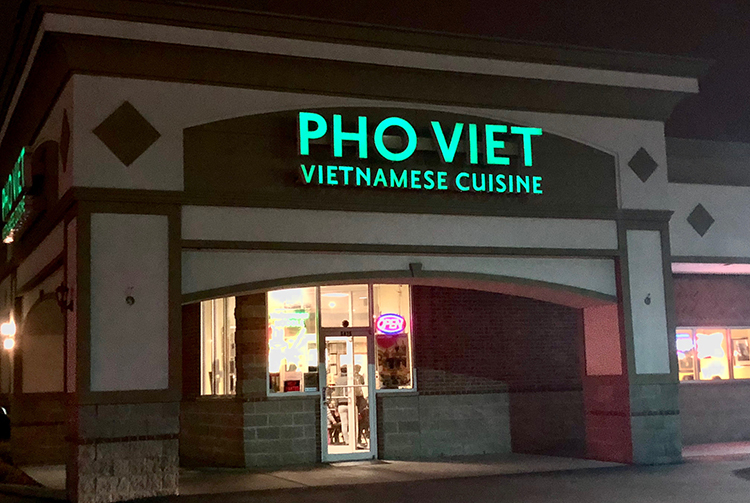 Greater Milwaukee has no shortage of places to get a bowl of the Vietnamese favorite, but few (if any) restaurants in the region offer pho that matches up to that of Pho Viet (5475 S. 27th St., 414-282-8852). 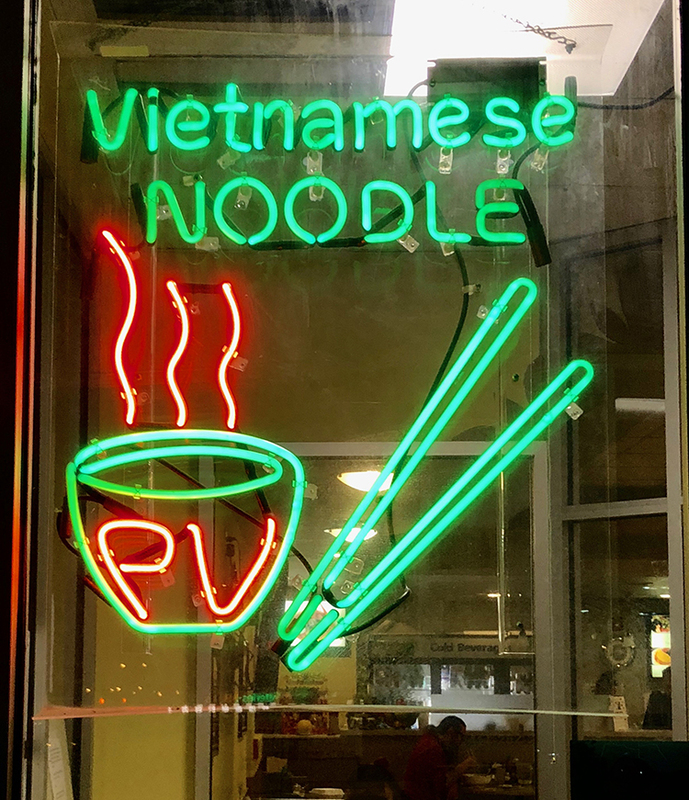 Since opening in late 2010, Pho Viet has quietly been an anchor in a plaza at the edge of Milwaukee—technically in Greenfield—that Pacific Produce also calls home. 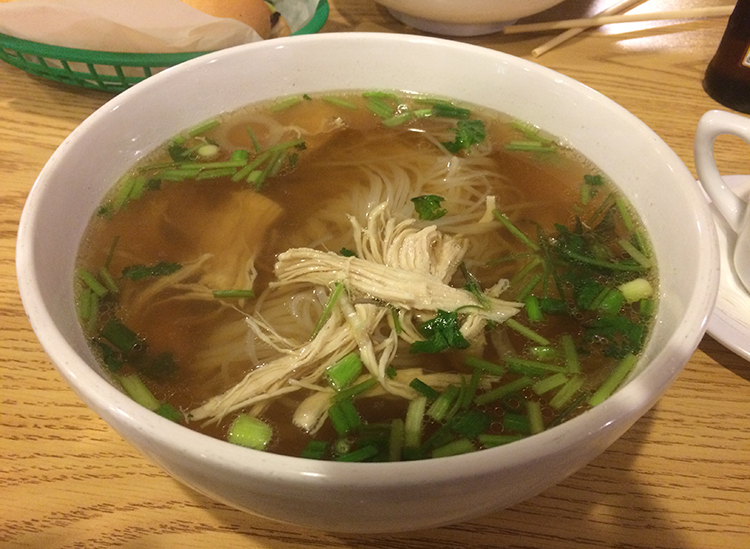 After hearing its legend whispered over the years, we set out to the suburban restaurant on a brisk early November night with the hope Pho Viet would fill our belly, clear our sinuses, and warm our heart. It didn’t disappoint. The space: The corner storefront in the Greenfield shopping center isn’t really anything special on the outside. Its exterior look closely matches that of Pacific Produce, and that’s about all there is to it. Pho Viet’s interior yields a similarly basic layout and frills-free setting. Fewer than a dozen booths line the walls and windows of the sprawling rectangular dining room. Between the surrounding booths, a cluster of tables are situated in the middle of the space. In all, we’d estimate the room can host about 80-100 diners. It’s bright, but not offensively so. Outside of some subtle paintings or framed prints on the walls and neon beer signage on the window, decoration is minimal. Instead, a few TVs playing college football captured our attention until our order arrived. Milwaukee Record‘s food: With daily hours that start in the morning and continue until 9 p.m. or 10 p.m., you better believe there’s a wide variety of beverages on hand. We bypassed the handful of domestic and imported beers, fresh lemonade, coconut drinks, tropical shakes, and sodas the menu offered to enjoy a caffeinated Vietnamese drink. 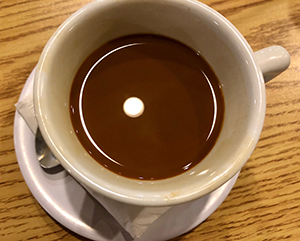 Our Cà Phê Đen—hot coffee and espresso over condensed milk—was a tremendous blend of bitter, midnight black coffee that, when stirred, was perfectly countered by the rich sweetness of the milk. The small cup ($3.50) was fine way to start a meal, and kept us humming hours after enjoying it. As we sipped the dangerously potent and delicious Cà Phê Đen, the food order we’d placed 10 to 15 minutes earlier came out. 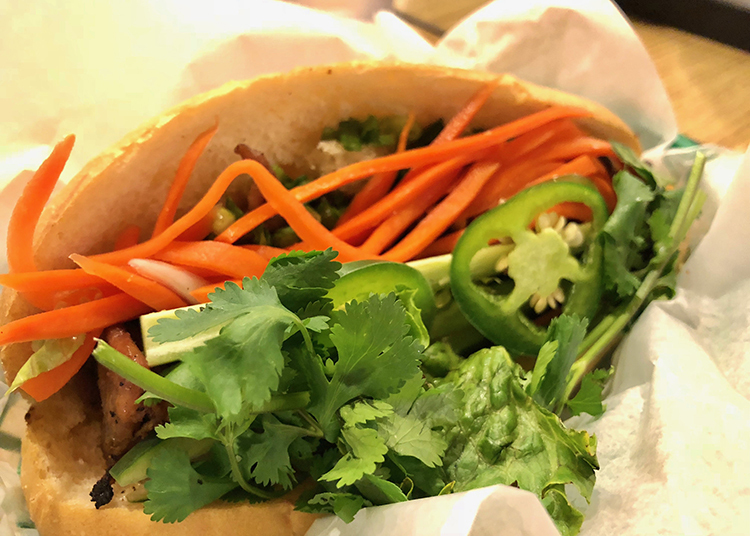 We started with a Bánh Mì Thịt Nướng ($4.25), a standard Vietnamese sandwich with grilled seasoned pork, along with fresh jalapenos, cilantro, and pickled carrots stuffed in a piece of lightly toasted French bread. Though it didn’t match the Bánh Mì we had at Pho Hai Tuyet (and really, what ever could?! ), it certainly gave Xankia a run for its money, and we prefer the more straightforward sandwich at Pho Viet to the mayo-covered Bánh Mì at nearby Pho Cali (formerly Pho King). In all, it was a great way to start things off—and honestly, it could’ve been both filling and satisfying enough on its own—but we came for the Pho. 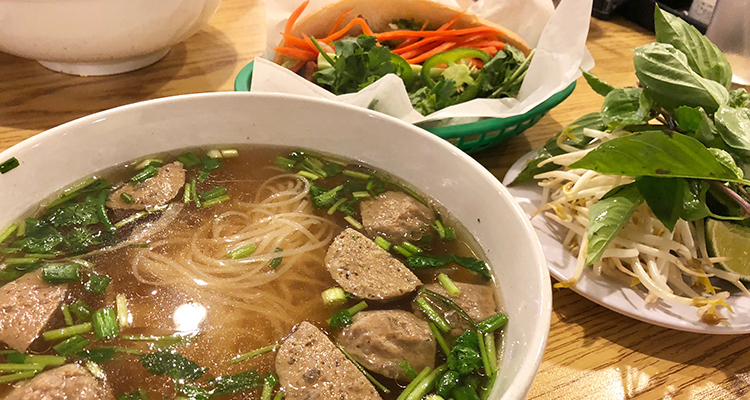 As you’d expect from a place with “Pho” in its name, the rice noodle soup is the star or the show, and it occupies the most space on Pho Viet’s sizable menu. With roughly a dozen types of pho, there’s something for every taste and any budget. Prices for 32-ounce bowls start at $8 and top out at $12.50. Wanting to sample some of the variety, we ordered two types: Phở Bò Viên (meatballs, pictured up top) and Phở Gà (chicken, pictured directly above). At $9.75 a pop, these massive bowls of meat, veggies, bone broth, and rice noodles were also accompanied by a platter with fresh bean spouts, basil, jalapenos, and lime wedges to help elevate the winning mixture. Each table also has the expected array of seasonings, sauces, pastes, and oils to allow further customization to take place. We spooned in chili oil, peppers, and sprouts until we achieved lip-tingling and sinus-emptying bliss. The verdict: On a wet and blustery night in a an increasingly cold and calloused country, we took a seat among a wide and diverse range of customers speaking a variety of different languages. By meal’s end, we’d left the suburban restaurant with a sense of warmth that extended from our stomach to our soul. If you’re looking to warm up (in any sense of the term), head to the small storefront next to Pacific Produce and let Pho Viet restore you.